Normally I would blog about the recipe I made, or describe the process (easy) or the end result (fudgy, rich, and delicious) but instead I should warn you - if you have a lazy gallbladder, this is NOT the treat to eat. I haven't decided what to do. I need to have my gallbladder removed probably, but the health process takes a long time. I went to the emergency room last night/ this morning after 6 hours of pain... all because I ate one of these little guys. Usually the pain subsides after four hours or so, but it was not going to happen. They gave me demerol and sent me home. 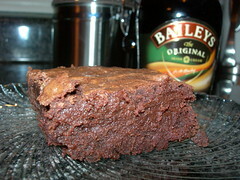 So what does a baking blogger do when anything with too much sugar, fat, or eggs will make her be in excruciating pain? I think I may take a break from this blog, until I can face the end result again. During last week's blur of baking blogs all making sticky buns and cinnamon rolls, I learned that October 4th is Cinnamon Bun Day in Sweden. In celebration of a country creating a holiday for baked goods, I made another version of last week's recipe - this time with cinnamon, cardamom, and orange zest in the middle, with an orange glaze. 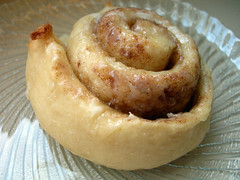 I wouldn't say this is my favorite cinnamon roll recipe ever, but they were still delicious. Lately I've been making recipes I've already blogged about, like harvest muffins and apple cake. But sometimes certain times of year demand old favorites to be made! I can't help it! Hopefully I'll do something more creative with apples or pumpkin in the upcoming weeks.